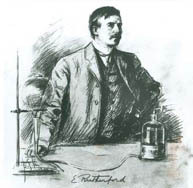 Ernest Rutherford’s groundbreaking work on the nature of radioactivity may have been conducted in one of the best labs in the world, but his work was so far out on the edge that the Professor of Experimental Physics at McGill from 1898 until 1907 found he often had to construct his own devices to prove his theories. The Rutherford Museum, in McGill’s Rutherford Physics Building, has many of the Nobel Laureate’s apparatus on display. In an experiment to describe the nature of alpha rays, Rutherford constructed the device shown here (in exploded view). Professor Jean Barrette, curator of the Rutherford collection, explains that this device was used by Rutherford to measure the deflection of alpha rays by electric fields, which, in combination with other experiments, allowed him to determine the charge-to-mass ratio of the alpha particles. He showed that this ratio is the same for alpha particles expelled from the different radio-elements and is equal to half that of the hydrogen ion. This work led to the revolutionary theory of radioactive transformation for which Rutherford is famous. Rutherford was shaken by this attack, but Soddy was intrigued by the New Zealander’s ideas. The debate eventually led to one of the greatest scientific partnerships McGill has ever seen. Within months, the two scientists were engaged in what today would be called an interdisciplinary collaboration to describe the nature of the atom, each approaching the problem from their respective backgrounds. Working in a brand-new lab funded by generous bequests from Sir William Macdonald, Rutherford and Soddy published nine important papers describing the nature of radioactivity, for which Rutherford was awarded the Nobel Prize in 1908. Soddy would also go on to win a Nobel Prize in 1921, for his investigations into the origin and nature of isotopes.